A small alpaca fiber farm located in Mid-Coast Maine. Producing spun yarn and rug yarn with hand made items. We have only had Alpacas for a few years but we fell in love with them many years ago and decided that once we retired, that we would raise them for their fleece. Alpacas are a domesticated member of the camel (camelid) family. The camelid family also includes llamas, guanacos, and vicunas from South America, and the Bactrian and Dromedary camels from Asia and Africa. This family of animals originated on the plains of North America about 10 million years ago. A common ancestor to the South American camelids migrated to South America about 2.5 million years ago. Two wild species, vicunas and guanacos, emerged. They still live in the Andes. It is believed that about 6,000 years ago alpacas were created through selective breeding which was heavily influenced by the vicuna. There are similarities in size, fiber, and dentition (teeth) between the alpaca and the wild vicuna. [suri] [huacaya] The two coat or breed types are huacaya and suri. Both fleeces are soft and free of guard hair. Ninety-five (95%) percent of alpacas are huacaya, with full, puffy fleeces whose crimp or crinkle is found throughout their fleeces. The lustrous, straight fiber of the suri fleece hangs down in "dreadlocks", giving the suri alpaca an entirely different appearance. Fibers of both types are considered luxury fibers in the textile trade because of their unique qualities. The eight basic colors are white, fawn, caramel (light brown), black, gray, brown (coffee), red, and piebald (colored blanket on a white body). Alpacas are shorn for their valuable fleeces. Their compact size contributes to easy management and to desirability as a companion animal. Alpacas easily learn to lead, jump in and out of vehicles, kush (sit down), and obey other simple commands taught all domestic members of the camelid family. They are popular show animals. 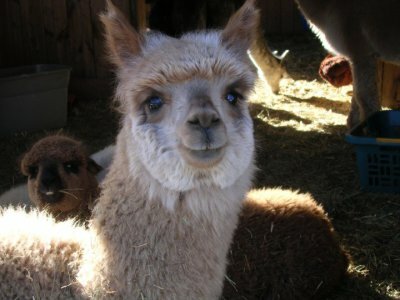 Alpacas can also be seen at fairs and fiber fests throughout North America. No other animal which produces fiber for textile use has such an enormous variety of colors. Alpacas are modified ruminants. They rank high in digestive efficiency and do well on good quality forage and hays. Occasional supplemental feeds, vitamins, and minerals are provided when required. An alpaca costs far less to feed than most traditional domestic animals. Alpacas are alert, curious, calm and predictable. They need the companionship of other camelids, and will huddle together or move en masse when frightened or wary. Alpacas express themselves with a soft hum, with other vocalizations, and with body language, such as neck posturing, ear and tail positioning, and head tilt. They have excellent eyesight and hearing, and will alert the herd and their human keepers with a staccato alarm call of perceived danger. Alpacas rarely spit at people unless frightened or abused, but will use this form of communication with each other to register a complaint.